Do you have questions about doing business with Alfa Barstools? Here are some of our most frequently asked questions. If you have a question that is not addressed here, please feel free to contact us by e-mail or by phone. Existing customers: we value your business! New visitors: We hope to have an opportunity to show you why we are a favorite among barstool retailers for the past 25+ years. What is the difference between “counter stools” and “bar stools”? A counter stool is 24 inches to 26 inches high from the top of the seat to the floor and is typically ideal for kitchen counters or peninsulas that are 36 inches from the top to the floor. Many more modern counters are 40 or 42 inches off the floor, which is the same as commercial bar heights. 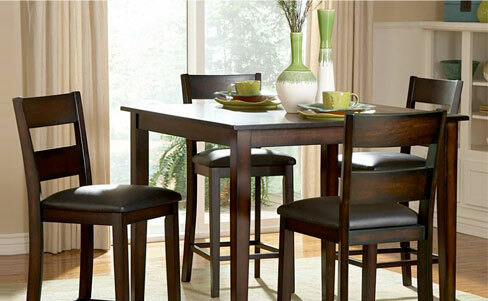 For these counter heights, you need 30 to 32 inch high bar stools. 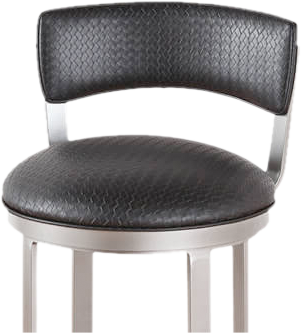 Do I pay sales tax when buying barstools online? We are required to collect sales tax if customers are a Florida resident. Do I need special service for unloading my delivery to my residence if my order requires a common carrier (truck service) rather than UPS Ground DHL or FedEx Ground? Not usually, but that is up to you. 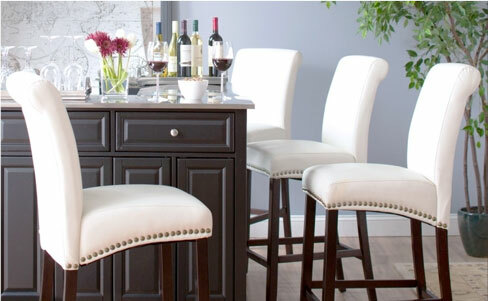 Bar stools and matching chairs are packed at a maximum weight of around 45 lbs. Tables and glass tops are heavier. Truck delivery companies are not required to carry the items into your house, so if you have heavier items please arrange for help. Are colors, textures, and wood stains accurate from photographs of barstools, tables, and chairs? We go to great lengths to accurately photograph and properly replicate the fabric and finish images on our site. However, many factors can alter the appearance, including the resolution and color settings on your display screen. Wood stains may appear lighter, colors and textures may not be accurate as a result of photographic, Internet, and computer inaccuracies and many other factors beyond our control. Therefore, we cannot guarantee that the product colors, textures, stains you see displayed on this site are perfectly accurate. When you order from Alfa Barstools, you accept these limitations inherent as a result of not directly viewing samples. We are not open to the general public but we do accept appointments for those who want to view our furniture in-person in our Lauderhill, FL warehouse. Your completion of an order constitutes your waiver of any claim you may have due to dissatisfaction with the product colors, textures and wood stains. If you are not sure, please contact us before ordering. Please review our return policy for more information. All our credit card orders are placed over the phone with a live person. All of the products offered through Alfa Dinettes come with a full manufacturer warranty. These warranties vary in length from one year to limited “lifetime”. Specifics on getting warranty service will depend on the item, the nature of the problem, the manufacturer and your location. Further details on manufacturer’s warranties will generally be attached to your new furniture. Keep in mind that the manufacturers warranties do not cover labor or transportation beyond one year; even a “lifetime” warranty covers replacement parts only. Although we ca not guarantee the customer’s pleasure in his or her selection, we warrant that all merchandise will be shipped in a manner meeting standards set by the manufacturer. The manufacturer’s warranty begins at the time the merchandise is delivered. except for this, there are no other warranties expressed or implied, including but not limited to, implied warranties of merchantability, fitness for a particular purpose, product availability, manufacturer order approval, order fulfillment time, etc., and all such warranties are specifically disclaimed. Alfa Dinettes shall not be responsible for any indirect, special or consequential damages related to warranty of product, delivery or delivery timing other than as specifically set forth herein. Should you have a problem related to manufacturer defect or damage, we will contact the manufacturer to arrange for local repair or replacement as allowed under the terms of the respective manufacturer’s warranty and at their discretion. We will act as your interface to the manufacturer and help with implementation of any needed warranty to ensure the work is performed in a timely and professional manner. Call us during normal business hours or email us at info@alfadinettes.com for additional information.